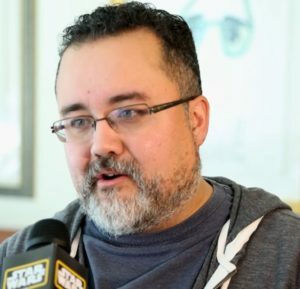 While he had been known amongst Star Wars fandom before 2014, it seems that the renown of Pablo Hidalgo, of the Lucasfilm Story Group, grew significantly with the first season of “Rebels Recon”.1 The show aired after each of the episodes of the first season of Star Wars Rebels, featuring host Andi Gutierrez, social media correspondent for Star Wars. In the show, she talks to cast and crew of the show, providing insights into each episode, as well as, at the end of the show, showing a clip from the following Star Wars Rebels episode. Towards the end of most of the episodes, Gutierrez fed a question or two to Hidalgo, who then answers them. In these answers, Hidalgo demonstrated himself to not only be a competent and confident answerer, but also clearly a fitting personality to inhabit such a role. “Rebels Recon”, however, did not immediately elevate Hidalgo as the primary expert. In the first episode, Gutierrez doesn’t mention who will be answering the question.2 In the following two episodes, she says she is inquiring the questions of “the experts.”3 From episodes 4 and onward, she refers specifically to Pablo Hidalgo,4 who, by that point, had become a known expert, perhaps the known expert. It is in this role that Hidalgo becomes well-known on the show, as it takes up a noticeable chunk of the show.5 It also accounts for most of his time on the show, since it is nearly double that of the rest of his time on it.6 In this time, he demonstrates his strong knowledge and insights into both Star Wars, in general, as well as Star Wars Rebels, in particular. But it is also his on-screen presence that helps make him so fan-friendly, with his calm and comfortable mien positively complementing his smooth sagaciousness. 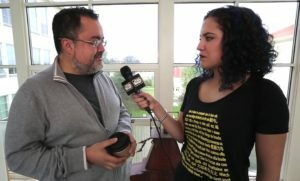 In each of the question and answer segments, Gutierrez presented Hidalgo with a question or two from fans that had tweeted and been selected (not clear by whom: whether it was Gutierrez, Hidalgo, and/or others) related to the previous episode. The questions selected related to stormtroopers, Kanan, and more. While he did answer one quite quickly (episode 13, relating to Cham Syndulla), most of his answers were a few sentences long and were quite thoughtful. A couple of his answers were even longer (episodes 5 & 9, relating to The [Grand] Inquisitor and stormtroopers, respectively). For a full listing of all of the questions and answers, you can read them all below. The first season of “Rebels Recon”, in addition to being a great accompaniment of Star Wars Rebels episodes and providing insights into the episodes, also gave us a new face of question-answering for Star Wars, Pablo Hidalgo. 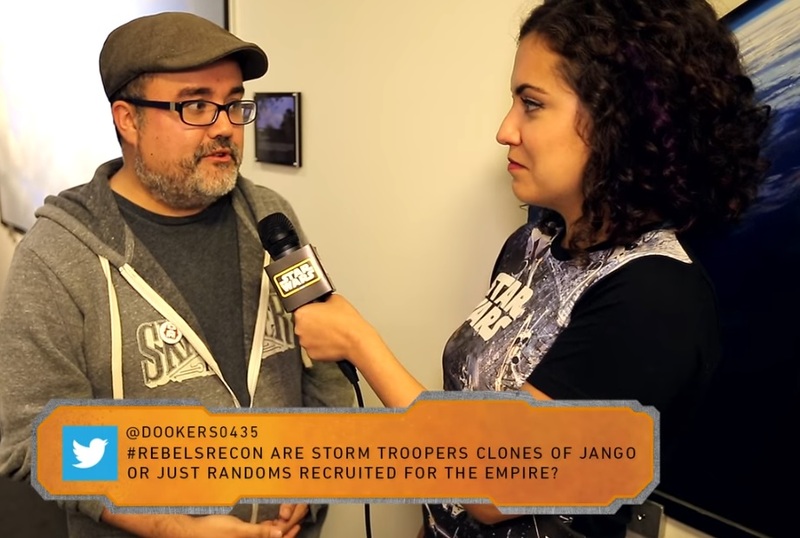 Q: Are the Stormtroopers in Rebels clones of Jango Fett? Or are they random civilians that were recruited into the empire? A: So here we are, we’re like five years before the events of Episode IV. By that time, the clone operations that the Republic started for The Clone Wars, they’ve been phased out. Clone Troopers age at twice the rate of normal people, so they’ve kind of aged out of service. And they’ve been replaced by recruits who are fervently patriotic and loyal to the Empire – men and women who believe in the cause – and have signed up to be stormtroopers. Q: In Droids in Distress we notice that C-3PO has mismatched legs, he has one really silver leg. What happened to him? A: Now exactly what happened to that leg, we haven’t told that story or necessarily figured it out. But, if you look at Episodes IV, V, and VI, 3PO has always had that mismatched leg. And, if you look at all the movies, 3PO has a tendency to be blown apart. And, in Empire Strikes Back, R2 and Chewie really aren’t that accurate when putting him back together. So, maybe sometime between III and IV, something like that happened, but we haven’t established that for fact yet. Q: How is the inquisitor not a Sith? He’s obviously a dark side user. A: He is a dark side user, but not all dark side users are Sith. Just in the same way not all light side users are Jedi. Being able to pick up a lightsaber and use it isn’t the mark of being a Jedi or being a Sith. So there are multiple sort of schools of skill out there. And, in the same way, just because Ezra, you know, exhibits his Force abilities, would you immediately brand him as a Jedi? No, because he hasn’t gone through that particular path of knowledge yet. So it seems like that the dark siders that are in charge of the galaxy, the Emperor and Vader are spreading some of that power out. But they’re not giving sort of the full ability that they have to this lower class of underling. Q: How the heck can The Inquisitor do that with Luminara? Does he have other dead Jedi? A: The Inquisitor’s plan with Luminara was pretty gruesome, and exactly how big that plan is, and whether or not it involves other Jedi, well, I’m not going to answer that. But exactly what was going on with Luminara, it’s kinda tricky to explain. But, from the looks of it, Luminara was captured during Order 66 instead of outright executed. She was taken to Stygeon Prime, and was probably executed right there in that prison cell. And what Kanan was sensing was the remnants of her signature in the Force, which was probably amplified by the presence of her preserved body in that cell. What Kanan saw was a hologram, a very vivid hologram. And you may be wondering, “Well, I’ve never seen a hologram that vivid before.” Well, actually if you look at The Clone Wars fourth season, the arc where Obi-Wan is Rako Hardeen, teams up with Cad Bane, there are holograms in that episode that are quite vivid. So, that is what you saw in that episode. So that is what you saw in that episode, that was one of the Inquisitor’s plans. And I say one of the Inquisitors plans you know. The Inquisitor is pretty resourceful, and we’ll see that the lengths that he goes in order to trap a Jedi. Q: This is the second time that we’ve seen the Empire’s kyber crystals plans foiled. We saw it once before with Anakin and Obi-Wan in The Clone Wars, but what has the Empire have in store for these crystals? A: Kyber crystals are what focuses the energy in a lightsaber to create a blade. So its got this very potent ability to focus energy in a very powerful way. So, I imagine that, if you had eight giant kyber crystals, and, perhaps, arranged them in a ring, and put them on a gigantic space station, that could probably have some very powerful effects. So, it is clear that the Empire is experimenting with something, and you could probably guess what that is. Q: Are Fyrnocks and Mynocks related? A: Let’s see: are they related? I don’t think biologically, because, what little we know about Mynocks, and what little we know about Fyrnocks suggests that they’re not, in any way, genetically related, but their names are very similar. The way it came about, though, was when one of the names we pitched for the Fyrnocks before it became the Fyrnock was a Nockedfyr, which is kind of a weird way to say night terror. But when Dave [Filoni] saw it, he said, “You know what, flip the syllables around, make it Fyrnock.” So you can still kind of detect the original name in there, but Star Wars creatures aren’t necessarily known for their nuanced names. Q: Kanan is often outmatched by the Inquisitor. But does that have to do with Kanan’s limitations, or the Inquisitor’s power? A: Well, I mean, it’s obviously a combination of both. But I think that we can’t forget about this time frame, is Kanan’s level of Jedi training. He never completed his Jedi training. You get a sense of that if you’ve read A New Dawn. But that is going to become more and more important as the series progresses. Q: Are Stromtroopers considered an elite corp of the Imperial military. Or are they regular soldiers? A: Oh, man, what is the best way of answering this that is fully respectful of the awesome 501st legion? It is easy to put on paper that stormtroopers are the super elite, the best of the best. But when it comes to having to put them on screen, they often fill roles where you can’t have the best of the best. I mean if you’re going to exhibit a soldier in Star Wars, an Imperial Soldier, you’re not going to create some sort of generic military guy, you want to use stormtroopers. So that means you have to have a mix, and that’s true in the movies. If you look, some of the stormtroopers are really good. The guys that raided the Tantive IV, at the beginning of A New Hope, those guys are really good, they really made short work of those rebel defenders. Now compare that to some of the guys that are chasing Han Luke, and Leia around aboard the Death Star. So, it’s not an equal mix. Which goes to the argument that these guys aren’t clones. You know because they’re definitely anything but uniform. Q: Where and when did Kanan get his lightsaber crystal? He seemed surprised that Ezra had even received one. A: Well, Kanan was a padawan during the time of the Clone Wars. So we have every reason to believe that he would have got his kyber crystal the same way that we see those younglings get them in “The Gathering” episode of The Clone Wars. So he probably would have gone on to The Crucible, that ancient ship, voyaged all the way to Ilum, and would have got his crystal there. And that’s kind of been tradition. The suggestion is that become such the ingrained notion where you get it, that Jedi may have forgotten there were other paths back in the day. So, when the ancient Jedi temple, like the one seen on Lothal, could actually have had kyber crystals there. So I think Kanan was surprised that one actually did turn up at a site like that. Q: Lando doesn’t have a ship in this episode. Does “Idiot’s Array” take place before he owned the Falcon, or after he lost it to Han? A: That’s a good point because, if Lando had the Falcon, he wouldn’t need the help of the crew of the Ghost in this episode. So, given how close we are to the events of Episode IV, if I were a gambling man, like Lando, I would put my money on the story taking place after he’s already said, “Good-bye” to the Falcon, at least once. Q: Did Agent Kallus know the senator was on their side from the beginning or did he figure it out when he saw that he was hurt? Q: Why are Jedi treated as fairy tales, despite being active 15 years ago, presumably within most people’s lifetimes. A: So, the thing is like it is very easy for us to forget, as Star Wars fans, because we know everything about the Jedi, we’ve followed their adventures, they’re our heroes, that, for the average person in the galaxy, they don’t know much about the Jedi. Even at the height during the Clone Wars, there were 10,000 of them. 10,000 across an entire galaxy. That means the average galactic citizen has never seen a Jedi, and has kind of only heard of them. So, it has always been this kind of abstract concept for most people, and, as a result, it is much easier for the Emperor to shape and twist that image, and that’d kind of what he does when he ended up in charge of everything. Q: Is Cham Syndulla from The Clone Wars related to Hera? In what way? A: He is most definitely related. Cham Syndulla is Hera’s father. Q: Is Stormtrooper armor air-tight? A: I’m going to guess the reason they’re asking has to do with those stormtroopers that Chopper blows out of the airlock. The good news for those troopers is that the armor can be sealed against vacuum, but the bad news is they don’t have much by way of an air supply. Trooper helmets have filtration systems and stuff like that, but, if they want to operate out in space, they’re going to need an extra air supply. Which is what we see in outside the Death Star in A New Hope when the Millennium Falcon comes in for a landing. Q: Tarkin has been in the last few episodes quite a bit, but shouldn’t he be overseeing the Death Star’s construction? A: Tarkin’s a busy guy, he keeps on the move. You’ve got to remember that, in addition to being sort of in charge of the Death Star operation, he is a Grand Moff, that he is a governor of the entire Outer Rim territories. So, he’s not just hold away on one project, he kind of has to represent the Empire across the entire Outer Rim.